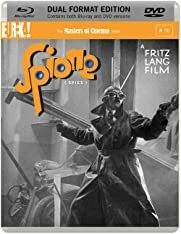 Fritz Lang's penultimate silent film, Spione [Spies], is a flawlessly constructed labyrinthine spy thriller. Hugely influential, Lang's famous passion for meticulous detail combines with masterful story-telling and editing skills to form a relentless tale of intrigue, espionage, and blackmail. 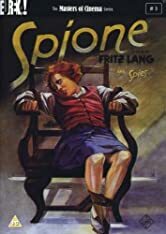 Setting in stone for the first time many elements of the modern spy thriller, Spione perhaps represents the zenith of Lang's silent artistry. The Masters of Cinema Series is proud to present Spione in a Dual Format (Blu-ray + DVD) edition. This is very much worth your time. Enjoy! Lang constructs Spies (1928) in six Episodes: 1) A non-character driven opening, showing the criminal spy network run by evil master mind Haghi, and the spies' high tech networks of communication. 2) The story of the hero and heroine of the film, noble English spy Donald Tremaine and Sonja Barranikowa, the Slavic spy who is assigned to get information on him 3) The attack on the sympathetic Japanese spy Akira Matsumoto by the evil spy organization. 4) The attack on Tremaine's life in the train. 5) The final destruction of the evil spy organization. 6) Tracking down Haghi, the master evil spy. These stories are virtually independent episodes, although they all use common characters. Lang's use of independent episodes will often occur in his other work. It has both strengths and weaknesses. The individual episodes are brilliant, but they do not tend to "build" on each other. They can also produce a sense of anticlimax. For example, the final episode of Spies is hardly a climax to the whole film, in any conventional sense. It is not as exciting as the events in earlier stories. One has a similar structure in Lang's later Ministry of Fear (1943). That film contains one brilliant set piece after another. They are linked together like pearls on a string, with little direct connection between them. Lang's hero, Donald Tremaine, is played by an actor who looks rather like Lang himself. One wonders if there is a bit of a fantasy here, Lang imaging himself as a spy. This is not at all self indulgence: a large number of great storytellers imagine themselves in their stories. It is part of the creative process. Despite speculation by some critics, I find it hard to regard Spies as a commentary on the coming Nazi era, soon to hit Germany. For one thing, the nationalities in the tale, English, Russian and Japanese, seem to be picked to be as far from Germany as possible. This is an escapist tale of international espionage, not a look at Germany itself. For another, Spies is in the tradition of a huge body of prose spy fiction, that had been flourishing since the late 1890's. Critical histories of spy fiction suggest that this genre is mainly centered on England, although it has representatives in many languages and countries. For example, see the introduction to Michael Cox' excellent recent collection, The Oxford Book of Spy Stories (1996). Lang's film is straight out of the British spy tradition, as embodied in the earlier stories in Cox' anthology. Lang's hero Tremaine is plainly English, and his boss seems to be the head of the British Secret Service. This sort of hero, agency and superior were staples of early (and later) British spy fiction. Lang's film seems close in its approach to the work of, the at one time very popular British spy writer, William Le Queux. Some parallels in both Spies and Le Queux: a gentlemanly English hero, who works for the British Secret Service. He is a full time professional, and brings considerable expertise to his job. The hero's boss, an agency official who is an older, typical English gentleman, bluff, honest and refined. A look at upper class high life as the area of operations for his hero, filled with bon vivants, and upper crust but racy social activities - in Lang's case, his hero has a valet, a million dollar wardrobe, and hangs out in expensive hotels and nightclubs. A concern with getting information about secret treaties, as the chief aim of espionage. An emphasis on means of communication of secret information. An international perspective, involving named countries throughout the world, and an "inside" look at their social customs - Japan in the case of Lang's film. Glamorous, somewhat lurid women who have liaisons with the hero, and who are sometimes involved in spy schemes. Physical peril and death traps for the hero. The use of chases, and high speed vehicles. All of these are common elements in Lang and Le Queux. Le Queux had been publishing since 1890, and was a long established writer by the time Lang began his film work, so I am suggesting an influence from Le Queux to Lang, not the other way around. Le Queux, as noted above, was full of schemes for communicating secret information. Lang is as well, but he gives a uniquely high tech twist to this. The opening of Spies shows radio, cameras, telephones, duplicating devices and other high tech appurtenances used by his spies. This is typical of a long range fascination in Lang with modern communication technology's ability to dominate and control people. In Lang's While the City Sleeps (1956), the television network and its broadcasting and news divisions are shown reaching out their tentacles, and gaining control of everybody and everything in the United States. One also recalls the mirror device for spying in The Spiders (1919), the automatic alarms in the office building in M (1930), the news reel cameras in Fury (1936), and the television monitoring in The Thousand Eyes of Dr. Mabuse (1960). These reflect the mirror device in Feuillade's Judex (1916). In both Le Queux and Lang, the realism of the social setting is implicitly used to justify a loosening in sexual morality. These are heroes that have to function effectively in the real world of upper class men and international diplomacy. The safety of their countries depends on this. They cannot exist in a straight laced fantasy world of Sunday School moralists. Instead they have to live in the real world of well to do men, mistresses, high society parties, romantic liaisons and intrigue. Because of this, they are constantly involved with glamorous loose women. Furthermore, their lives are filled with turmoil, and near sudden death. All of this suggests that they can and should have affairs. These arguments are undoubtedly specious, but they make superb escapist entertainment. One hastens to add that the heroes are always single men, that they treat the women well, and that the women want the affairs just as much as the men. One can see aspects of Lang's interest in Le Queux' themes as far back as The Spiders Part II: The Diamond Ship (1920). The hero of that film is placed in a death trap: an underground pit that fills with water. The gang of The Spiders is mainly interested in getting hold of international treaties. Lang's most important skill as a director is his use of composition. His shots tend to show elaborate geometric patterns. One favorite Lang composition shows a large circle dominating the space of the shot, playing off against the rectangular border of the frame. In Ministry of Fear, we see the circular table, and the characters gathered around it for the phony seance. In Spies, there is the circular tunnel down which the train speeds. The interior of the train itself also shows a circular corridor. Rooms in Lang tend to be large. His characters are rarely hemmed in, although the hero of The Spiders seems often to be climbing up and down ladders between floors. We often see the corner of one of Lang's large rooms in his shots. It reminds one of J.G. Ballard's dictum, that there is a moral significance to the angle between two walls. There is a recurring shot in Spies, of a woman hurled into a room's corner. Haghi tends to be always seated at his desk, which seems to be an extension of him; whereas the women in his office are either standing, sitting at external tables, or seated spectacularly on top of his desk. One always sees that they are outsiders in these shots, but outsiders with spectacular power. A recurring Lang posture shows a woman holding something up at arm's length to look at it. These are among the most glamorous shots in Spies. One can also see the influence of Feuillade on Lang's compositions in Spies. One of Feuillade's trademarks, the double door with one door open and one door shut, occurs in Spies as well; it will recur in The Indian Tomb (1959). Feuillade liked to compose scenes in several flat planes, as David Bordwell has pointed out; we get a similar effect in Lang. A door or window will be open toward the back of the shot, revealing another wall with people standing in front of it. We see such shots in Haghi's office, in the telegraph office towards the beginning, and the shot where Sonja sees in Tremaine's railroad car from her own. The shots of the stairwell in Haghi's building are built on the sort of diagonals one occasionally sees in Feuillade, as well. The unusual uniforms worn by Haghi's guards also recall Feuillade: here they are in head to toe black leather. In general, Lang's film is full of uniforms of every sort: Lang seizes every chance to include police and Army members and include them in his compositions. Spies is full of shots of clocks ticking away. These anticipate the opening of Ministry of Fear, which also shows Ray Milland up all night, watching a clock. They also recall the workers in Metropolis, who tend machines that look like large clocks. Both Metropolis and Ministry of Fear suggest that human beings are subjected to such time oriented machines. One also remembers the many clocks that control the action in The Woman in the Window, the pickpocket with the watches in M, and the alarm clocks in Clash by Night. Other Lang devices include the mirror in the hotel suite, recalling the store window in M, and the mirror around the fireplace in The Woman in the Window, which are used by Lang to show a single person reflected at two angles. A striking shot uses a shadow as a sinister way for a character to make an entrance, like the villain in M.
When people walk in Spies, they tend to do so in forceful straight lines. For example, we see guards marching purposefully past Haghi's open office door, parallel to the planes of the shot, perpendicular to the spectator's light of sight. Also: at the dance, when the hero is looking for the heroine's dropped necklace, we see first a close-up of feet moving in one direction, then another set of feet moving exactly perpendicular to the first. Third example: at the telegraph office, the bad guy exits directly towards the back of the shot, followed by the entrance of the hero perpendicularly, straight from the left of the screen. Lang tends to show people in medium shot, say from the waist up. There is often plenty of "upper" space in Lang's compositions. It shows the high walls and ceilings of Lang's sets, which are usually tall and imposing looking. It also gives room for Lang's characters to jump up or suddenly stand up, which they do frequently. Feuiilade's shots also often have this sort of upper space: the lower half of the shot shows the people, the upper half shows the architecture of the place in which the characters find themselves. A whole parallel world in Spies are the close-ups of characters' hands. Lang often cuts to hand shots, showing the characters holding clues, guns, papers or the Russian icon which plays such a key role in the plot. There is some doubling up of characters in Spies. The Japanese spy and Kitty echo the hero and heroine of the movie. The benign head of the British Secret Service is a double for Haghi, who heads his evil spy ring. Both men are usually shown in their office, behind their desk, a desk loaded with high tech communication equipment. There is some difference in staging here. The British character is always shown with men in his office, while Haghi is typically entertaining his women agents. The British Secret Service head acts as a father figure to the hero. He gives him personal encouragement, but mainly this seems designed to certify that everything the hero does is fully approved by the patriarchy that runs society, symbolized by the Secret Service chief. The British office is set up to indicate the Secret Service chief's authority. He sits on a tall chair, while the hero and other visitors are in a chair whose seat is at virtual floor level. The relationships in the office are simple: a boss with men subject to his authority. This makes the hero's relationship to society simple and straightforward: he is subject to the proper, male social authorities, and approved by them. By contrast, Haghi's relationship to the women is vastly more complicated. They are often shown sitting on top of his desk, like visiting queens. They are in a huge number of different postures and positions in his office. Though, obviously, I couldn't say which version MoC are likely to come out with - their site claims to have a newly restored version - I'd be a little wary of the piece above. "Donald Tremaine" appears only to be mentioned in the American version of the film shortened and drastically rearranged by MGM. In other prints, the lead spy is known simply as "326" - his name is never revealed. This American version runs at nearly half the length of other known versions of the film so conclusions made really have to take in the bigger picture. I'm not meaning to be unduly negative - the piece makes some interesting points - it's just when I saw "Donald Tremaine" alarm bells started ringing in my head. I believe the American version is the one most widely seen and analysed so I'm very happy to be waiting for this MoC disc which they're saying is "restored to its original state". Yippee! Kino have completely removed all the original German intertitles from their release of SPIES and replaced them with Americanized English intertitles. At other times they have superimposed text over the images. They have also, unfortunately, repeated an intertitle in the middle of the film by mistake, thus rendering a portion of the film unintelligible. The MoC Series release of SPIONE is pure PAL and has original German intertitles and optional English subtitles, thus maintaining the original look and feel of the film as closely as possible. Fritz Lang’s SPIONE was restored between 2003 and 2004 by the Friedrich-Wilhelm-Murnau-Stiftung. As no original negative exists, various nitrate copies were used. Due to its length and excellent condition, a copy from the Národni Filmovy Archiv, Prague, formed the restoration’s basis. Problematic scenes were replaced using materials supplied by Filmarchiv Austria and Screensound Australia, and missing sections were added with the help of the Cinémathèque Française. Moscow’s Gosfilmofond’s dupe negative contained a complete set of intertitles displayed as flashtitles. These matched the original intertitles found in part within the Austrian nitrate copy. The original German opening credits sequence has not survived. Cast and crew details were culled from the censor card and rendered in the same graphics as the intertitles. Other contributors include the Bundesarchiv-Filmarchiv, the Stiftung Deutsche Kinemathek, and the UCLA Film and Television Archive. The lab work was carried out by L’Immagine Ritrovata, Bologna. If the image quality of the DVD is even close to that of the print used for the world premiere of the restoration shown at the London Film Festival at the end of last year (the details above are those from this restoration print), it will be very impressive. That print was pristine with beautiful contrast, sharpness and detail, doing full justice I think to Lang's cinematography and style. Gary's comparison with the Kino dvd. My question is: why is there a line white line running down the left side of every screen capture from the MoC disc? Is this normal? Happnes sometimes when you get captures with a Mac... I don't know why. The DVD presentation ï¿½ as with all Eureka/Masters of Cinema releases ï¿½ is fabulous. The DVD is short on the usual extensive extra features this time, but there is no lessening in quality and the film certainly stands-up well on its own to make Fritz Langï¿½s Spione a very worthwhile addition to the collection. A friend was commenting to me what a great couple Willy and Gerda make in this and Die Frau im Mond. Willy was definitely a dish -indeed so is Gerda for that matter - in fact wasn't she Lang's squeeze at the time? And does this maybe give both movies a touch of personal projection, with Willy as Lang. Annie I am in love with the shot of Willy in overcoat in the leather upholstered car, leaving the scientist in the second sequence of Frau im Mond. Do you experience similar quiverings? Haven't watched it yet, I'm afraid to say. But I will definitely get back to you when I eventually do. It really sounds er...quivery! Can I assume that all silent films released by Eureka are presented at original projection speed? Usually, I prefer NTSC over PAL, but in this case the original speed presentation can only be found on PAL DVDs, right? There are lots of stories of this film running for 180 minutes - but that's at 16fps! The MoC edition of SPIONE is 25fps and is the most complete version of the film available on DVD (we consider original intertitles, and an avoidance of ingrained English text into the image, to be "more complete" than those which desecrate the image for various reasons). I cannot vouch that all Eureka DVDs prior to the Masters of Cinema Series are presented at their original projection speed, but I can vouch that silent films in the Masters of Cinema Series do strive to best represent the original projection speed. Just watched it. I sat there 2+ hours, mouth wide open for the restored print is one of the best restorations IÂ´ve ever seen. Together with the stellar, absolute flawless transfer this might easily be the best MoC release so far. RECOMMENDED! A MUST-SEE! AND A MUST-HAVE FOR EVERY SERIOUS COLLECTOR! ...oh, I forgot to mention the excellent booklet with an essay by Jonathan Rosenbaum. Apropos Jonathan: he wrote another excellent article about DVD restoration and the consequences of the new "DVD film culture" . Due to a big backlog of unwatched discs, I finally got around to watching Spione several nights ago. A really marvelous film in the Mabuse tradition. The restoration is spectacular, as can be seen from the Beaver captures. One technical question: I noticed what I can only describe as very prominent edge enhancement throughout---most every straight line on screen was quite jagged in appearance (e.g., the stems of the roses seen in the last Beaver capture). I use an all-region Jaton DVD player (interlaced mode) in the PAL format (without player conversion to NTSC) through an InFocus X1 front projector (full-frame image size is about 75" on the diagonal, and I watch from 10 feet away). I haven't made any recent adjustments to the settings on either the player or the projector, and other PAL DVDs I've watched with the Jaton do not seem to be similarly affected. In contrast to my experience, reviews of the Eureka MOC release don't describe any significant EE, and the Beaver's captures don't seem to demonstrate it. I have to believe that the problem lies in my equipment or setup. Any suggestions? Has anyone else experienced what I'm describing? Sounds like your equipment has a progressive part of the chain. The disc is not progressive, unfortunately. All MoC discs since SPIONE are progressive. FilmFanSea: this is the same problem I encountered with the disc, but I didn't know to call it edge enhancement. It's definitely not your equipment. I see the same problem on my laptop display. "Edge Enhancement" isn't the correct term for this phenomenon -- but I know what you mean. Lines that should be smooth are jagged. A laptop display is naturally progressive. I see it too on my 23" Apple HD Cinema Display -- also progressive. I don't see it on any native PAL DVD player, played through a native PAL CRT display. I had the same problem with Michael. Depending on the souce setting (auto or film) I can choose between the familiar flickering effect of stationary objects displayed on the screen or the jaggedness being described above. Peerpee, I appreciate your assurance that the newer discs will all be progressive, but is there a solution for playing the older ones? I recently purchased numbers 4-9 and have not had a chance to test them yet. Should I open them and do so or am I likely to encounter the same display problems? It's difficult to say what you'll experience. We receive many reports of the interlaced discs looking "absolutely fine" from US folk using multiregion players. It seems there are certain chipsets which render our interlaced discs differently. MoC #1, #5, #6, #10-onwards are all progressive. Of the interlaced discs: #2, #3, #4, #8 were each authored by different authoring houses and so were #7 & #9. Thanks for the info, Nick. I'll check my settings. I may also try it in my Malata (although the dog recently chewed up the remote, so I'm not sure I can still make it work). Thanks, too, to Gregory and denti for their input. Always nice to know it's not just me. Spione arrived today, and though I was disappointed to hear that MoC fell short of doing a progressive transfer--shame on you!--I just about pissed myself when I saw the quality of the film. Excellent. Absolutely beautiful. This is my first MoC disc by the way and now I'm definitely going to watch for new titles with the same excitement otherwise reserved for the CC. Great job guys. And though the extras were perhaps sparse I will say that the promo gallery was beautifully handled. And the book is tastefully handled. Now, just a question: why do all these websites advertise a commentary for this title. I knew from dvdbeaver that there wasn't one included prior to purchase, but was that the original intention? #7 and #9 were authored by different houses, right? I ask because #7 (Asphalt) does not have the same "jagged-line"-problem as this disc. By the way, I tried out the disc on my wife's CRT set-up, using a Jaton DVD player (which does excellent PAL-to-NTSC conversion) on interlaced-mode. Well, the same jagged lines are present. Very noticeably, sadly. The image otherwise looks so damn good, but I just can't get over this problem, which really mars this otherwise perfect DVD. Other non-progressive PAL discs that I have (including the other MoC titles) do not show this problem to such a degree (with Metropolis it's only noticeable if you're looking out for it). It really seems like something is wrong here, not just an interlaced disc being shown on a progressive display. No, SPIONE and ASPHALT were authored by the same authoring house. There are different types of interlaced transfers. The Jaton is a known problem player with the particular type of transfer used on the discs in question. 98% of other players are okay with the discs. Last edited by peerpee on Wed Nov 23, 2005 10:30 pm, edited 1 time in total. If this is at all useful, I am playing this (and other MoC interlaced titles) through an upscaling Momitsu (always set to 720p for PAL) to a progressive display (Pio 435 Plasma.) No jaggies. Nor any jaggies at either 576i or 576p. The Momitsu does seem to be very dependable with PAL discs in doing its own deinterlacing.